The Japanese Stomping Fish (Tilapia japonica stompus), is a large, semi-aquatic species of carp that has evolved the ability to breathe air and come ashore to find food and stomp on stuff. They are yellowish with blue fins, and often wear big cowboy boots to aid in stompification. The nearly-blind fish also must wear contact lenses to locate their prey and have long black barbels (whiskers) that curl at the ends, resembling a mustache. The Japanese Stomping Fish's diet consists of absolutely anything it can grab with it's massive mouth, including, but not limited to, paperclips, pebbles, pencils, sand, soil, and sticks. They also have been known to eat tubes of super glue by the dozen. Often, a fish can go seventeen-thousand days without a meal before it dies, it can subsist on the glue from a postage stamp for a month, and only rarely do they need to eat a litter of newborn jaguar cubs. Sometimes, when bored, tired, terrified by a predator or sometimes when they're just feeling silly, they will even eat a blueberry or two. However, it is a well-known fact that blueberry consumption may cause horrendous diseases. 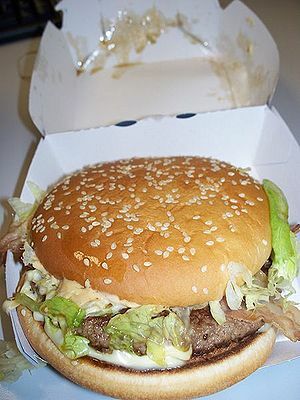 The mighty Double Cheese Whopper, (with or without pickles) is one of the few adversaries that the Japanese Stomping Fish cannot stomp (due to it being so freakin' greasy and massive, I mean, c'mon, it's practically a heart attack in a bun!). Japanese Stomping Fish originality inhabited Japan, but due to the invasion of Chinese Kicking Shark, they had to flee to new lands or get kicked. They snuck aboard ships and landed on the United States coast, where they displaced (assaulted) all native fish species and many land animals, such as the passenger pigeons, once-living rodents like the Stegosaurus and Dodo and Mammoths like the saber tooth tortoise. They now dwell in the great lakes, where they antagonize beach goers and stomp on their stuff. Due to their relatively small size, succulent and flavorful flesh, and their habit of breathing, no living creatures is ever capable of capturing them except rats, mice, three kinds of other fish (NOT mackerel! ), alligators, wussy little crocodiles, sharks, ponies, pugs, double-goots and ravens, sea gulls, shrews, pigeons, algae, swordfish, knifefish, reindeer, reindeer spelled like raindear, giraffes, horseflies, armadillos, turnips, sloths, rhinos, penguins, tigers, lions, bears, whales, Venus Fly Traps, mice, moo cows, elephants, bulls, cats, dogs, purple cats, purple dogs, purple catdogs, hotdog monsters,hypnopigs gym teachers, bats that do not live in oak trees, ferrets and those who like ferrets, pine tree gremlins, garden slugs, hacklesninks, guppies, minnows, quaggas, zebras, porcupines, gazelles, linosacholis, cheetahs, Parakeets, panda bears, roadkill, raccoons, corn, asparagus, summer squash, factories, dead tuna fish, artichokes, anchovies, and the double cheese whopper (with or without pickles). The Japanese Stomping Fish is a slow moving amphibious fish that uses it's fins as feet to stand upright and stomp on things. Wearing steeltoe boots aids in their ability to really stomp on stuff harder than they could in fins alone. 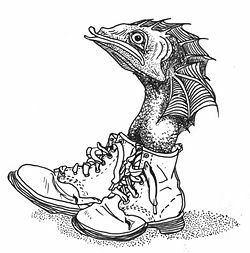 The fish's main objectives in life are to be born, purchase a suitable pair of boots, and stomp on as much stuff as they can before they die. The Stomping fish is also known to swim, though only in water shallow enough that it's fins touch the ground below, so it can stomp on the crabs, fish and other things on the lake bottom. If threatened by a predator such as YO! Sushi, it will quietly stomp away into the water very quietly, where it waits until the threat has left to return, squeal in excitement, and and get back to stomping. The fish spawns fifteen to thirty eggs every third summer, laying them in sewer grates or under garbage pails, leaving the young (who hatch in sixteen minutes) to fate. The young spend eighteen years in an underground, multi-winged larval stage before moulting in their 19th spring and becoming free-ranging adults. Although less effective at stomping, the Bulgarian Cycling Trout is also an adversary not to be taken lightly. One day a typical carp was swimming through a pond in Japan, when it saw a crawfish walk by wearing brand new cowboy boots. Oh how little Carpy wanted boots like the crawfish's, but his family had all been yanked by a hook from the river, gutted, and sold at the market, so he had no place to get money, when he decided to ask the crawfish for his. When he asked, the crawfish just pinched him and told him to get out of his yard. So little Carpy sadly swam away. Suddenly, inspiration struck. He would make some boots! After months of labor and hard work, Carpy finally had a pair of new steeltoe boots. They were so heavy that he stomped in them, and when he saw Mr. Crawfish, he remembered what he had done to him , and pressed his boot down hard on his adversary's head. Mr. Crawfish was no longer. Carpy then had a great big family with a goldfish ( before being hooked and gutted by a fisherman) and his traits were passed on, becoming the Japanese Stomping Fish we know and hate today! Never attempt to chase it away, as it is likely to stomp on you even harder. Never attempt to catch it and cook it for dinner, as they are poisonous. 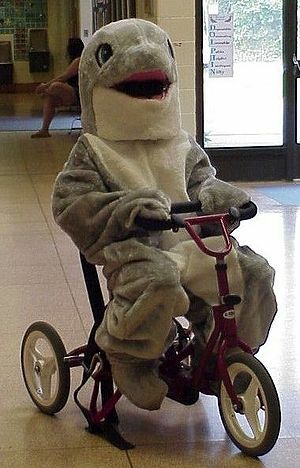 Never, ever run away, as they are faster than you think, at nearly 15 miles per hour for several seconds. Never resist, as the Japanese Stomping fish is an unbeatable adversary that will stomp you regardless of how you attempt to defend yourself. Don't read this checklist, as it is useless due to the fact that this whole thing is just really, really silly.